Of all the US wrecks, the Spanish treasure ships are perhaps the most spectacular. Spain brought gold and silver across the Atlantic for centuries. From thousands of transports, only a small minority wrecked. The most ill-fortuned flotas (convoys) were those of 1622, 1715, and 1733, which ran in to storms, and mostly ended up at the coast of Florida. Padre Island shipwrecks. Spanish ships heading for Havana from Veracruz, but sunk off the coast of modern Texas in 1554. Three have been located: San Esteban, Espíritu Santo and Santa Maria de Yciar. 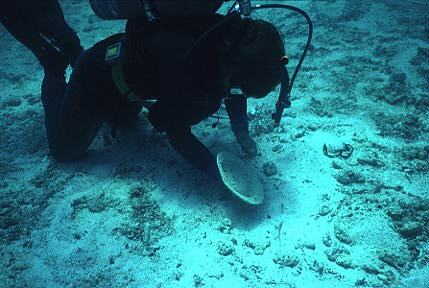 Salvage of the Espíritu Santo by treasure hunters in 1967 destroyed so much historical information, that the state of Texas later passed a law protecting historical shipwrecks. In 1972-73 the San Esteban was investigated by archaeologists. Finds are displayed in the Corpus Christi Museum. Ref: National Geographic, July 2001, and IJNA 13.4 1984 . Emanuel Point shipwreck, Florida, USA. Discovered in 1992. Possible Spanish wreck from 1559, possibly the Capitana ship El Jesús. Ref: British Museum Encyclopaedia of Underwater and Maritime Archaeology. Link. Red Bay wreck. Basque whale fisher ship in Canada. Found in 1978 and investigated by Robert Grenier, dated to late 16th century, possibly the San Juan from 1565. Ref: National Geographic Jan '85, IJNA 15/1986, 19.4 1990 & 38.1 2009, and M-A Bernier: Les archéologues aux pieds palmés (Héritage 1996). Link. Link. Nuestra Señora de Atocha, and Santa Margarita, ships from the Spanish 1622 treasure fleet, sunk off the Florida Keys. In 1969 Mel Fisher started searching for the Atocha, a 20-gun guard ship. In 1980 Santa Margarita was found, and in 1985 the scattered remains of Atocha was found on ca 17 m depth. During the first years, archaeological evidence may have been destroyed. Eventually, the excavation was lead by archaeologist Duncan Mathewson. In 1985-86, remaining timbers was tagged in situ, and re-deposited in a deep trench under water. On the wrecksite, three astrolabes and a wooden cross-staff were recovered. Two of the astrolabes are (1999) displayed in the Naval Museum of Lisbon. Some silver bars are displayed in the Historical Museum of Southern Florida, Miami. Other objects are in the Mel Fisher Maritime Museum, Key West, Florida. Atocha site map. Ref: Stephen Johnson, The Complete Idiot's Guide to Sunken Ships and Treasures. Santa Margarita is also described in National Geographic, Feb 1982. The NGS has also made a film about Atocha. Nuestra Señora del Rosario. Probable wrecksite of one more of the 1622 ships that sank in the Florida Keys. Discovered in 1971 by George Fischer of the National Park Service, and investigated. Dry Tortugas wreck, Florida. Possibly also from the ill-fated 1622 flota, investigated/salvaged on commercial basis with a ROV on 500 m depth. Link . La Belle, a.k.a. "La Salle Shipwreck". La Salle's French expedition of 1684-1687 tried to locate the mouth of the Mississippi River, but went too far, ended up in Texas where this 15 m long 6-gun frigate sank in shallow water in 1686. The lower part of the hull was found in 1995, excavated 1996-97, by draining the wreck area with a cofferdam. Conservation still continues. Photo of bronze gun © Texas Historical Commission. Ref. Stephen Johnson: The Complete Idiot's Guide to Sunken Ships and Treasures. Unidentified vessel from Phips' fleet, Quebec, Canada. Excavating a wreck from 1690. It was discovered in 1994 in shallow water. Parts have been excavated. Ref: Archéologia No 352, janvier 1999 & National Geographic, Aug '00. Winchester. British warship that hit a reef and sank in 1695 off Florida. The site has been located on 9 m depth and some objects have been recovered. Ref National Geographic, July 2001. Henrietta Marie. English slave ship sunk near Key West, Florida in 1701. Located in 1972, investigated in 1983. Among the finds was the ship bell, which made identification positive. Ref British Museum Encyclopaedia of Underwater and Maritime Archaeology. Fleet of 1715. Ten or eleven Spanish ships loaded with treasure were lost in a hurricane off the Florida east coast. About 1200 sailors died in what may have been Spain's largest naval loss ever. Coins were located along the beach by Kip Wagner in 1948; various wreck sites have been located and treasure has been salvaged since the 1960s. One ship that has been identified is Urca de Lima, which is now part of the Underwater Archaeological Park, with signs for visiting scuba divers. Ref: Angus Konstam, Atlas versunkener Schiffe (Weltbild, Augsburg 1999) and Stephen Johnson, The Complete Idiot's Guide to Sunken Ships and Treasures. Whydah, Sam Bellamy's pirate ship sunk by a storm in 1717. Located near Cape Cod in 1984. Identified thanks to the ship bell. Described in National Geographic, May 1999 and Angus Konstam, Atlas versunkener Schiffe (Weltbild, Augsburg 1999). San José and San Pedro. Two of the 1733 flota ships that was lost in the Upper Florida Keys. San José was discovered in the 1960s by Tom Gurr. According to archaeologist George Fischer, the vessel was completely buried at the time of its discovery, in excellent preservation, and more than one deck was intact with plenty of cargo-related artefacts. So, what is the present state of this wreck? Another wreck from the 1733 flota was San Pedro, that became the Florida Keys first Underwater Archaeological Preserve, and is now a popular recreational dive site. In 1999 Indiana University prepared an underwater guide about the San Pedro. Recreational divers get the guide printed on a slate to take along during the dive. HMS Fowey. English warship sunk off the Florida coast in 1748. Discovered by George Fischer in 1975. Extensively investigated in 1983. Photo at right from the investigation. The Ronson ship. Remains of a transatlantic tobacco ship. Abandoned and covered by landfill on Manhattan, New York, around 1750. Discovered on land in 1981, excavated and partially conserved with PEG. Ref. Peter Throckmorton: The Sea Remembers (1987). Machault. French fifth rate frigate, built in 1757, carrying 26-32 guns. 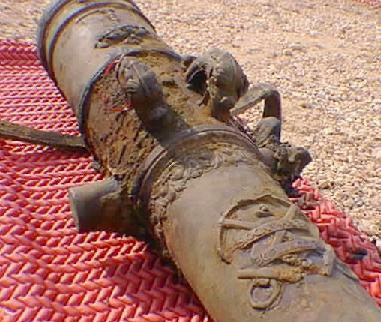 Scuttled in battle in 1760 at Restigouche River, Canada. Located in 1968, excavated 1969-72, when large parts of the hull were raised. Defence. US warship sunk off the coast of Maine in 1779. Discovered in 1972, partly well-preserved under sediment. Ref: Peter Throckmorton, The Sea Remembers (1987). El Cazador. Spanish warship sunk with all men in 1784 south off Louisiana. Located on 80 m depth by fishermen in 1993. Very little remained of the ship, except for the cargo of silver coins, which was salvaged. Ref: Stephen Johnson, The Complete Idiot's Guide to Sunken Ships and Treasures. Juno. Passenger ship lost with 1000 passengers off the US East coast in 1802. The remains have recently been reported found. Shipwrecks of Lake Champlain. Various ships sunk during battle in 1776 and in 1812. The gun boat Philadelphia has been salvaged, and is now in the Museum of History and Technology of the Smithsonian Institution, Washington, DC. Ref: British Museum Encyclopaedia of Underwater and Maritime Archaeology. Hamilton and Scourge. US Navy ships that sank in a very unusual storm on Lake Ontario in 1813. The weather was absolutely calm and the ships had all their sails set. But during the night they were caught by a sudden squall. Crews were asleep and got no time to reduce sail, and the took in water and sank. Ergo: Don't sleep with all sails set. Both wrecks were discovered in 1973 on 87 m depth with side scan sonar. The ships are very well preserved. Filmed in 1990 with the ROV Jason and described in National Geographic, March 1983. Sonogram of the Hamilton. HMS Breadalbane. British bark built in 1843, sunk in 1853 in the Canadian Arctic on 102 m depth. The wreck is very well preserved with all wood intact and two masts standing. Described in National Geographic, July 1983 and Science News, Sept 19, 1981. Arabia. Sidewheel river steamboat, sunk in 1856 in the Missouri River. Located in 1987 and perfectly preserved in the wet mud. 100 tons of objects were recovered, conserved, and now displayed at the Arabia Steamboat Museum, Kansas City. Ref: British Museum Encyclopaedia of Underwater and Maritime Archaeology . Comet. Side-wheel paddle steamer built in 1848. Sunk in Lake Ontario in 1861. USS Monitor. Prototype ironclad warship designed by John Ericsson. Had two 11 inch guns in a round turret. Famous for its battle with the CSS Virginia, in early 1862, during the US Civil War. Sank on 70 m depth in a storm off Cape Haterras, North Carolina, later in 1862. Discovered with side scan sonar in 1974. Very corroded and "too expensive to recover", declared National Marine Sanctuary, to "remain undisturbed in situ". However, in 1998 the propeller was salvaged, and in 2001 the steam engine. For 2002 there are plans to raise the turret. Described in National Geographic, Jan 1975. Link. Alvin Clark. Two-masted schooner built in 1846 and sunk in Lake Michigan in 1864. Raised in good condition in 1969 but destroyed due to lacking conservation/preservation. Ref: British Museum Encyclopaedia of Underwater and Maritime Archaeology. Link . 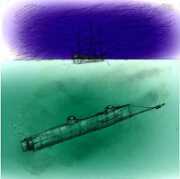 Confederate submarine H.L. Hunley, was a small submarine cranked by her crew. Sunk in battle in 1864 off South Carolina, USA, when she attacked and sank the USS Housatonic. The 12 m long sub was found in 1995, raised in 2000, now being conserved. Link. Link. Brother Jonathan. Sidewheel paddle steamer loaded with gold and sunk in 1865 off California. Recently located by Deep Sea Research, Inc.
Bertrand. Sternwheel river steamboat, sunk in 1865 in the Missoruri River. Located in 1968. Many objects were recovered and conserved. Ref: British Museum Encyclopaedia of Underwater and Maritime Archaeology. Schooner X. Unidentified 19th century schooner in Lake Michigan. Very well preserved on 90 m depth with mast still standing. SS Islander. Passenger ship sunk off Alaska in 1901 on 110 m depth. It was supposedly loaded with plenty of gold which has not been located. The main section of the hull was salvaged in 1934. The previously missing bow section was located in 1996 by Ted Jaynes and Nick Messinger using side scan sonar. RMS Republic. White Star Line ship sunk in 1909 off Nantucket Island. Loaded with gold and located in 1981. Empress of Ireland. Passenger ship sunk 1914 in St Lawrence River, Canada, after colliding with another ship. The Empress sank in the cold water in only 14 minutes, killing more than 1000 passengers. The wreck is on 25 - 45 m depth. Maud. Norwegian Polar exploration ship built in 1917. Used on expeditions by Roald Amundsen in 1918-23. Decommissioned and sunk in 1930 off Victoria Island in Canada's Northwest Territories. Lies well preserved on 10 m deep. Ref: British Museum Encyclopaedia of Underwater and Maritime Archaeology. U-166. 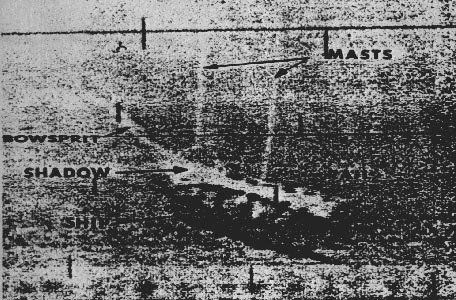 This German submarine first sank US passenger ship Robert E. Lee, was chased and finally sunk in 1942 south of the Mississippi delta. All 52 men died. Located with an ROV in 2001 on 1500 m depth. Edmund Fitzgerald. 220 m long iron ore carrier built in 1958. In 1975 she sank very suddenly in a storm on Lake Superior. There were no survivors, and the wreck lies on 160 m depth. No archaeological significance but a dramatic example that modern ships are vulnerable too.